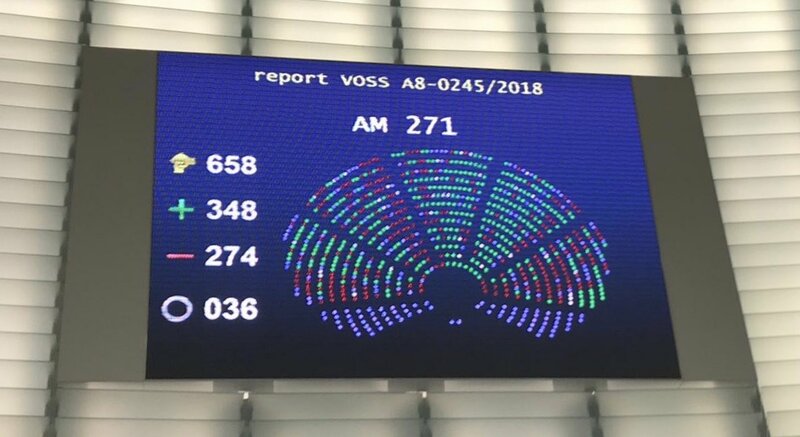 At a time when the Spanish government is asking billions of Euros of solidarity to bail the country out of its financial problems, the same government is disowning its commitment under EU legislation (article 5.2.b) of Directive 2001/29/EC) to provide a system to compensate artists and the film and music industry for the private copying of audio and audiovisual works. Indeed, 115 Million Euros of royalties collected every year in Spain to pay for the economic damages of copying are now being confiscated from right holders. This change contradicts the aim of developing a creative economy and it also goes against EU law on copyright and the internal market. The Spanish government is now proposing a ridicule subsidy of 5 million Euros per year to compensate for the same economic damage. Meanwhile, the prices of consumer goods used for copying have not been reduced since the levy was abolished. The cultural and creative industries, which contributed 4.5% to EU GDP and employed some 3.8% of Europe’s workforce in 2008, are hostage to a situation which makes the State responsible for the payment of the compensation (Royal Decree 20/2011 of 30 December 2011 on urgent measures of budgetary, tax and financial nature to correct the public deficit). This measure is not legitimate as it makes artists and cultural industries directly responsible for the state deficit. The compensation for private copying is a measure destined to natural persons who benefit from an exception to the exclusive right granted to right holders to authorise or prohibit the reproduction of their protected works. According to the Court of Justice of the EU’s ‘Padawan’ ruling of 21 October 2010, it is for the natural persons benefitting from the exception to compensate right holders for the private use made of their works. The new system in Spain cuts the link between the act of private copying and the payment of fair compensation due to right holders. The legitimacy of the previous system was recently upheld by the Spanish Supreme Court in a dispute opposing collecting societies to an enterprise selling blank DVDs in Spain and which did not pay the royalty due for private copying. The Supreme Court recalled that according to recent EU case law only the legal persons who manifestly do not use the devices and media for private use are exempted from the payment of the royalty, and that Member States which adopt a system of compensation for private copying are liable for the payment of this remuneration to right holders. The plaintiff was found guilty and obliged to pay the remuneration as foreseen by the former system for private copying applicable in Spain until 31 December 2011. Based on this system, the remuneration has to be paid by those who make the devices, media and supports used for digital reproduction available to individual users. Such a royalty system cannot be assimilated to a tax. Private copying remuneration is not state aid. It is a system developed at international and EU level to encourage and reward artists as the main agents of creative, cultural and entertainment activities. This system of royalty compensation is implemented in 23 EU Member States. Other Member States such as the UK and Ireland do not authorise copying for private purposes. In any event no Member State assimilates the private copying royalty to a state tax. The Spanish regulation is infringing EU copyright and internal market rules. It is also questionable under EU state aid rules. We therefore call on the Spanish Government to comply with EU law and to respect artists and the cultural and creative industries, by reinstating the previously existing compensation system for private copying. EUROCINEMA (Association of Film and Television Producers) was founded in July 1991, on the initiative of all professional associations representing film and television producers in France in order to set up ways and means to promote a genuine Community policy for the audiovisual and cinematographic industry. EUROCINEMA represents the interests of film and television producers to the European Communities concerning all the issues directly or indirectly affecting film and television production (intellectual property rights, regulation, trade issues, MEDIA programme etc.). EUROCINEMA has a vital function aimed at arguing the fundamental role of the film industry and film-makers in a politically and economically integrated Europe. EUROCOPYA is the European Association of Audiovisual & Film Producers’ collective management societies. EUROCOPYA notably represents all European producers’ right collecting societies active in the field of private copy remuneration, notably in Spain, Denmark, Sweden, Portugal, Germany, Belgium, France, the Netherlands, Switzerland, Austria and Poland. Founded in 1980, the Federation of European Film Directors (FERA) represents 39 directors’ associations from 29 countries. FERA speaks for approximately 20,000 European screen directors, who work in all formats and genres, promoting and defending their cultural, creative and economic interests both in Brussels and at the national level. Communication from the Commission to the European Parliament, the Council, the European Economic and Social Committee and the Committee of the Regions Creative Europe - A new framework programme for the cultural and creative sectors (2014-2020), 23 November 2011, p. 2. Building a Digital Economy: The importance of saving jobs in the EU's creative industries, TERA Consultants, March 2010.